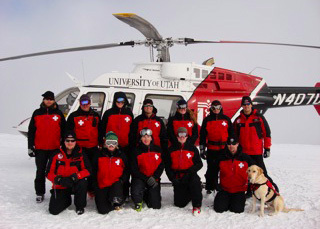 The Sundance Ski Patrol consists of twenty five professional ski patrollers and four avalanche rescue dogs covering four hundred and eighty acres of inbounds terrain. Currently the Sundance Avalanche Rescue Program consists of four Labrador Retrievers; Mick, Chloe, Oakley, and Angus, handled by Tracy Christensen, Craig Butler, Carey & Janet Pierce, and John Woodruff. The Sundance Dog Program is partnered with WBR and participates in annual dog schools and trainings with other WBR dog teams from around the Wasatch. The Avalanche Rescue Dog Program at Sundance has not only been a great resource for avalanche safety, but has also developed into a great resource for promoting avalanche awareness in the community and creating an opportunity for the general public take part in a unique and memorable experience. If you ever find yourself skiing at Sundance, please feel free to stop by the ski patrol shacks and say hi to these amazing dogs.